The Solution: The Bazooka Vacuum Sleeve was designed and developed as an easy method to remove loose slugs or scrap. 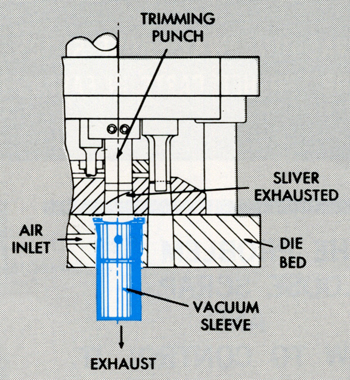 The vacuum sleeve will convert compressed air into a vacuum which is applied at the die opening. This vacuum not only prevents slugs from pulling out with the punch, but it carries them away from the die surface through the vacuum source and deposits them in a contaner. The advantage of the vacuum system over plain compressed air is - with vacuum you have control of the slugs or parts. With compressed air - pieces can fly back onto the working surface, interfering with the die operation. Installation of Vacuum Sleeves works very well when the application is for individual die openings, such as slugs, slivers, shavings, piercings, and small pieces of scrap. Typical example of a vacuum sleeve installation preventing loose shavings from pulling up with trimming punch. • The shaving measures .640" long x .030 wide x .020 thick. • A VS750 Vacuum Sleeve with an "A" diameter of .75 is installed beneath the die opening in the die bed. • The vacuum not only prevents shavings from pulling up with the punch, but also carries them away from the die surface. 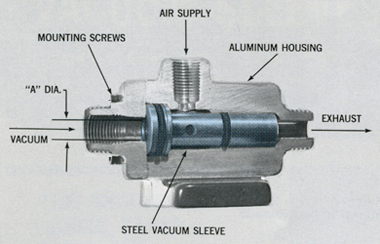 Sectional view of Bazooka Vacuum Sleeve illustrates how the metal scrap can pass through the sleeve without disrupting the vacuum flow or damaging the unit. • Center chamber is vacuum passage and allows removal of solid material. 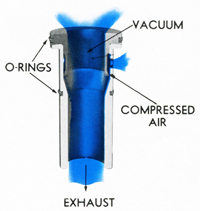 • Compressed air is forced to flow through the circular orifice creating the required vacuum. • "O" rings which seal compressed air, allows liberal machining dimensions of housing for installing vacuum sleeve. There are 2 simple measurements to consider when selecting a vacuum sleeve for your application. 2 - Select a vacuum sleeve having an "A" diameter equal to or greater than this dimension. Vacuum was measured in inches of mercury. For optimum air flow, an operating pressure of 60 psi (max) is recommended. The standard VS110 through VS940 Sleeves are made from steel. Standard VS1250 through VS2000 are made from aluminum. • "B" and "D" diameters to have smooth surface finish. • "B" diameter to be concentric with "D" diameter within .005 T.I.R. The inside diameter of hoses, tubings and fittings of air supply line must be as large as the "F" diameter shown in the drawing below. The Problem: It was necessary to remove loose slugs from two notchings and seven piercings. By preventing this scrap from pulling up with the punches, you eliminate trouble from scrap accumulation and reduce down time while increasing production and die life. 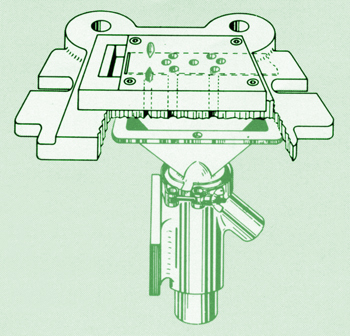 The Solution: Since it would have been impractical to place individual Vacuum Sleeves under each die opening, a Funnel Unit was installed (as illustrated). This unit removes scrap from all nine openings and exhausts it into a container. an "A" diameter that is equivalent to this area. In reference to the application shown, this total area equals .182 square inches. Is a complete Vacuum Unit to which a compressed air line is attached. It consists of the VT Housing, Vacuum Sleeve and V-Band Coupling. They are used with either a Funnel or Cap. There are 6 sizes available with "A" diameters from 5/16" to 15/16". To make a complete unit you require a Funnel to be attached to the Vacuum Transducer. There are 3 sizes available with diameters from 5/16" to 15/16". An example of a complete part number is VT500F2. 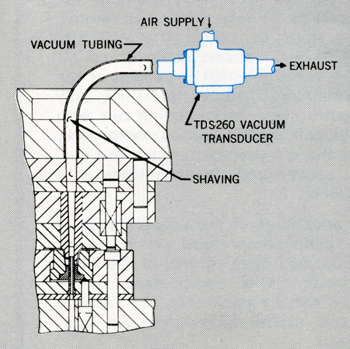 The VT500 indicates the Vacuum Transducer has an "A"
an "A" diameter of .500". Funnels and vacuum sleeves can be replaced and purchased separately. How to extend the use of a standard funnel to fit a special application. Standard funnel opening can be changed to meet your requirements. For example, by mounting an aluminum plate to the flange of a standard F1 Funnel, the 1 5/16" x 3 1/8" opening can be increased up to 2 3/8" x 4". Mounting holes located and drilled by user. 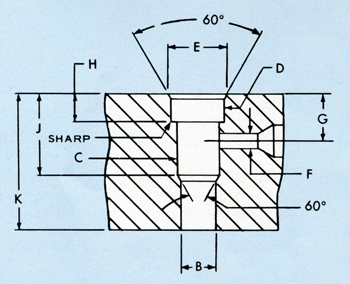 Shown is a strip layout and portion of a die which requires vacuum to prevent 4 notches and 2 oblong slugs from pulling up with the punches. 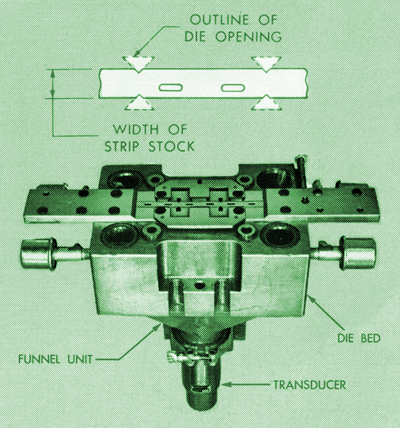 Since it would be impractical to install a separate sleeve under each separate die opening, a Vacuum Transducer and Funnel Unit was attached to the bottom of the die bed to accommodate all six openings in one unit. 1 - The "A" diamtere must be approximately 1/8" larger than the longest dimension on pieces of scrap. 2 - The "A" diameter must be equal in area to the total area of die openings into funnel. 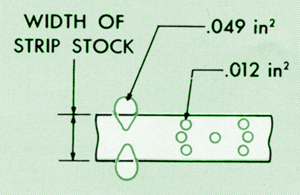 For the example shown, the longest dimension is 5/16", which is the lenght of the oblong slug. The total area of the 4 triangular die openings and 2 oblong die openings equals .224 square inches. This is approximately equivalent to an "A" diameter of 9/16" (.248 square inches). Therefore, the TOTAL AREA FACTOR is greater than the LENGTH OF SCRAP FACTOR, and determines the size of the unit. The complete Part Number was VT 620 F2 Vacuum Transducer and Funnel Unit. TDS Vacuum Cap Units: Available with "A" diameters from 3/16" to 5/16"
The TDS Series Vacuum Transducer incorporates a steel Vacuum Sleeve in an aluminum housing. This provides a wear resistant and durable unit used primarily for small chip and dust removal applications. Can be used on any drilling, milling or grinding operations. Most popular installation is to mount unit at some convenient spot on the machine and use tubing to bring vacuum to area where cleaning is required. 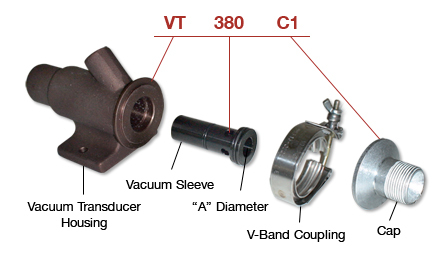 See Vacuum Sleeve Chart for vacuum levels at various air supply pressures. VT Threaded Vacuum Cap Units: Available with "A" diameters from 5/16" to 15/16"
To make a complete unit you require a Cap to be attached to the Vacuum Transducer. Includes a steel Vacuum Sleeve which provides a wear resistant and durable unit. Below is an example of a complete part number. 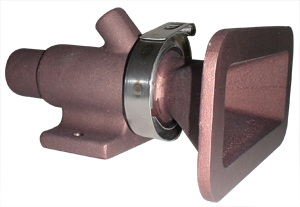 TDRH Vacuum Cap Units: Available with "A" diameters from 1 1/4" to 2"
Threaded vacuum inlet and exhaust connections. Straight through vacuum passage. Two piece construction eliminates need for vacuum sleeve. The Problem: Due to the design of the part, a trimming operation has to be done upward, otherwise, secondary operation would be required. It is important to keep this shaving (.190 x .020) from falling back onto the surface of the die. 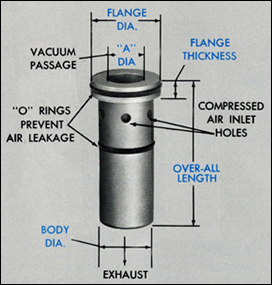 The Solution: A TDS260 Vacuum Transducer was selected as the "A" diameter (.260) provides sufficient clearance. The installation is simple, as the tubing is used to connect the die opening to the Vacuum Transducer. By having vacuum in the die opening, the loose shavings pass upward through tubing, Vacuum Transducer, and exhaust hose into scrap container. In the application below, a solid press bed made it necessary to remove loose scrap horizontally. 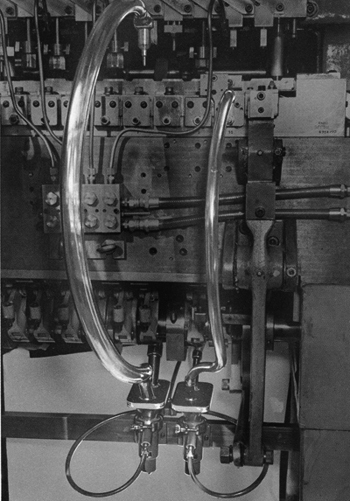 A standard VT 750 C1 Vacuum Transducer with Cap Unit and Funnel was mounted under the bottom die and attached to a special funnel. 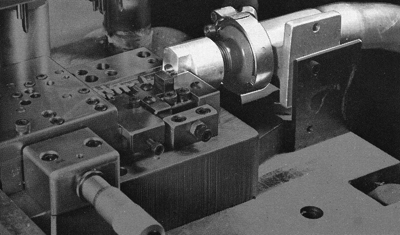 The Problem: Photograph shows the fabricating die of a small formed part in a progressive die. The problem is to remove the finished part at the final cut-off station. The normal procedure is to use compressed air to blow this part into a container. Quite often this is inadequate as the parts could fly in various directions and often do not leave the die area. these parts would then interfere with the strip stock causing down time or rejected parts. The Solution: Use a standard Vacuum Transducer and Cap Unit and a simple adapter designed to locate the flow of vacuum as near as possible to this finished part. The flow of atmospheric air picks up each part as it is cut off, and removes it from the die area. It passes through the adapter and Vacuum Transducer into a suitable container. Two funnel type units were mounted below the press at a convenient spot. Flexible tubing was then used to bring the vacuum from the Funnel Unit into the area where the scrap was located. The important thing to note in this application is that the vacuum units themselves can be mounted away from the area where the vacuum is required, and flexible or metal tubing can be used to bring the vacuum into the inaccessible areas. • Air line filter in the compressed air line. Clean air is essential for trouble-free operation. 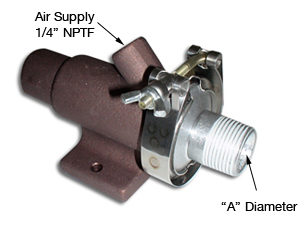 • An Air Pressure Regulator is very important as it will save on air and allow proper adjustment of unit. It is the flow of atmospheric air through the die openings which removes the loose scrap. The maximum vacuum flow occurs at operating pressures of 40-60 psi. It has also been proven that pressures of 20-30 psi create sufficient vacuum flow for successful removal of loose scrap while minimizing air consumption. • The cost of compressed air can be expensive. It is strongly recommended that air be supplied intermittently on speeds of 160 strokes per minute or less. This can be done using a switch activated by the press ram or a solenoid valve. This minimizes air usage and can actually provide improved scrap removal if the vacuum is applied intermittently.